Award-winning journalist, commentator, author of upcoming book "The Moment"
Sixteen years ago, in a small office in Boulder, Colo., Roger Fidler was at the top of the newspaper technology world. Behind him was an original Apple Macintosh Duo laptop fitted neatly into its dock, and a Radius Pivot 15" monitor oriented in its signature vertical position. And sitting on his desk, next to his cup of coffee and stack of manila folders, was a prototype of a thin - about an inch thick - electronic tablet that was poised to revolutionize the print media. The device, slightly larger than an inter-office envelope, would show text, graphics, sound and video - in color - would fit in your purse or under your arm, would be powered by a rechargeable battery and magically connect to other information sources. Sound familiar? That was 1994. Long before Amazon's Kindle or HP's Slate or Sony's Digital Reader or Hearst's Skiff. Long before Apple's rumored tablet device likely to be unveiled this month at an invitation-only event in San Francisco. This was in the heyday of the newspaper business. Big metro papers were throwing off profit margins of 20 and 30 percent. Bureaus in London, Tokyo and Johannesburg were commonplace. Few expected those good times would end anytime soon, although a handful of us knew that technology around the corner could change our lives forever. Fidler, who also was part of an early videotext experiment in the '80s called Viewtron, said that the newspaper business was on the verge of a major revolution, what he called a "Media-morphosis." "All forms of media that we know today will be transformed over the next 10-15 years," he said in a promotional video for the device back then, as models wearing shoulder pads under their mustard-colored outfits and news stories about Bosnia were the reference points of the day. "An important part of this revolution is the emergence of the electronic tablet....Tablets will be a whole new class of computer. They'll weigh under two pounds. They'll be totally portable and have a clarity of screen display comparable to ink on paper. They'll be able to blend text, video, audio and graphics together. And they'll be part of our daily lives around the turn of the century," the narrator said during the video. "We may still use computers to create information, but we'll use the tablet to interact with the information." 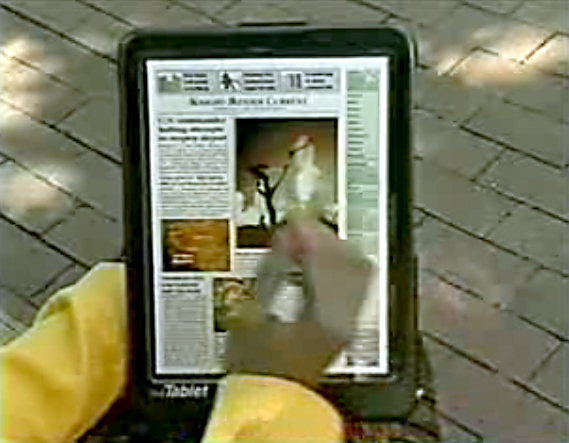 Ultimately, Fidler's tablet idea was never made into a real product, and faded away. Later, in an interview, he said screen technology was not yet ready to make the idea a reality (screens at the time just sucked too much power). So funding for the project was pulled, the Boulder lab was closed and the industry moved on to the next big thing -quarterly earnings, acquisitions, younger readers, and a weird invention called The World Wide Web. Fidler now runs Digital Publishing Initiatives at the University of Missouri's Donald W. Reynolds Journalism Institute and is helping to set standards for e-readers and tablets across the industry. But, of course, we all know now that Roger was right. He and his team were just a few years too early. This week, Fidler told me that, between the single-function e-readers like the Kindle and the multi-use tablets like Apple's, the opportunity to realize his dream may still be right in front of us. "We are living in some exciting times," he told me from his home in Missouri. "There is so much happening, so much going on." Hopefully, Apple and its new tablet will prove that as well, but it may be too late for many in the newspaper and magazine business. Nevertheless, several publishers - Sports Illustrated, Conde' Nast, Popular Science (this one is the coolest) - are showing off their own prototypes for tablet-based publications. But what if, back then, the industry had the will and the technology was a bit more advanced? Would we still be witnessing the fundamental meltdown newspapers and magazines are experiencing today, or on the verge of that "mediamorphosis" Fidler dreamed about? Or, more likely, would we be still be facing print's end-of-life, just on a shiny flat screen with stories of balloon boy, Octomom and Tiger Woods streaming to our devices every second of every day? We may really be witnessing the creation of a new mobile media model - much like how the iPhone invented a new cell phone metaphor - one where news, sports and entertainment information are truly portable, readable and in real-time. But it is less likely to save most of the old publishers as to give rise to a new breed of media entrepreneurs who won't have to support those printing presses and those legacy costs. Although, with video and social media and gossip and gaming taking center stage, journalism may play a cameo role, at best. And, for readers, you won't have to get ink on your hands any more. You can partially thank Roger Fidler for that. Bryan Monroe is a visiting professor at Northwestern University's Medill School of Journalism. He was the former president of The National Association of Black Journalists (NABJ), editorial director of Ebony and Jet magazines and assistant vice president/news at Knight Ridder. He has also been a regular contributor to CNN and helped lead the team in Biloxi, Miss., that won the 2006 Pulitzer Prize for coverage of Hurricane Katrina. He can be reached at www.bryanmonroe.com.